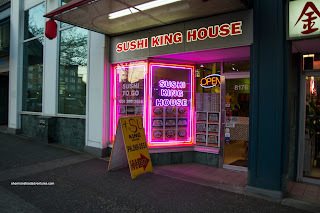 So with a lip that would rival Angelina Jolie, I suggested we hit up Sushi King House nearby because plopping sushi into my mouth seemed like the least painful alternative. Bear started with the large order of Gomae which was decent. Loved how there wasn't some goupy sweet syrup on top. His plate of Nigiri was an indication of what was to come. 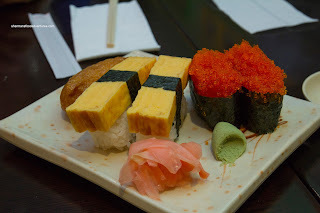 The piece of tamago practically dwarfed the gummy sushi rice. Sometimes more is actually less. 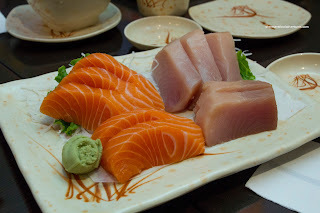 That would be the best way to describe the Salmon & Tuna Sashimi as each slice was massive. Nothing particularly wrong with the fish, but the large slices made eating them cumbersome and far too dense. The best analogy is beef carpaccio. Would a thicker slice necessarily make it better? 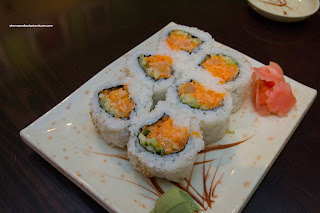 Not looking particularly attractive or well-made, the Dragon Roll was, you guessed it, large. 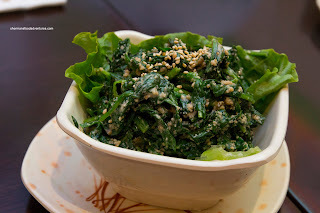 Yet, there was too much of that gummy rice, hence, each piece was cumbersome to eat. When we picked it up with our chopsticks, it fell apart on contact. 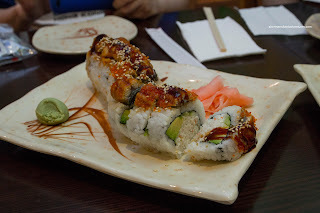 On the positive side of the ledger, the individual components such as the imitation crab, avocado and generous amount of unagi were fine though. The same could not be said about the Chopped Scallop Roll. Judes thought that the scallop was fishy while the textures were wrong. The main contributor of the textural issues was the same gummy rice which was used aggressively. She ate one piece and that was it. Onto some cooked food, Judes and Boss Woman both had the Tonkatsu which came with salad, rice and miso soup. We were pretty surprised at the inclusion of 2 cutlets, especially for $7.95. Unfortunately, the meat was chewy and not moist at all. At the very least it was crispy on the outside. 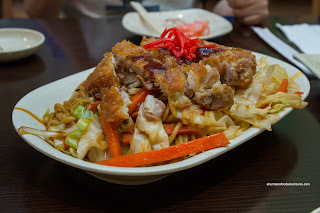 In addition to sharing the sashimi and dragon roll, Milhouse and I had the Chicken Yakisoba as well. 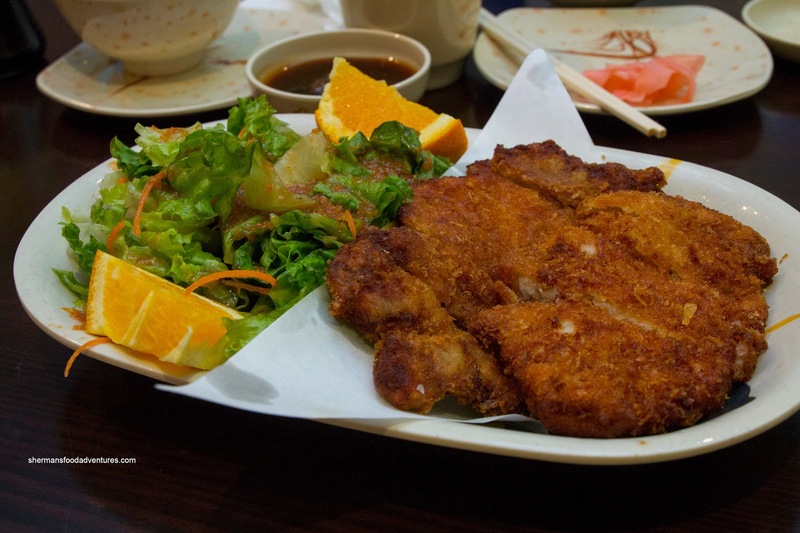 Much like the tonkatsu, we were amazed at the portion size considering it only cost $6.95. 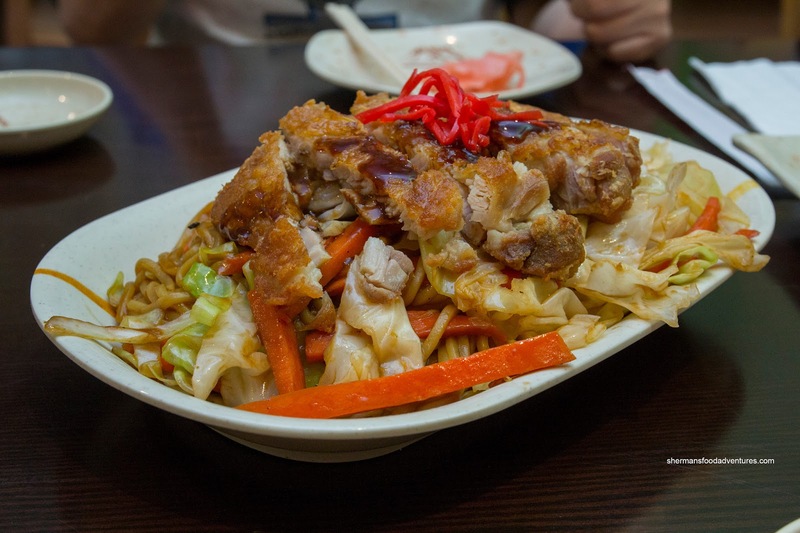 In actuality, it resembled a Chinese stir-fry more than a yakisoba, but it was okay nonetheless. The noodles were a touch soft while the cabbage and carrots were crisp. The fried chicken cutlet on top was moist and tender. 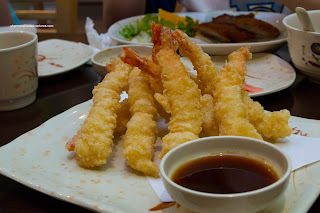 Lastly, we had the Prawn Tempura (which our server neglected to write down) which was completely wrong in our books. Resembling over-battered fried prawns you'd find at a cheap buffet with a sauce that tasted like sweet & sour, it pretty much summed up our meal - the food ain't authentic. Now we have no prejudices against unauthentic food, but it has to be prepared properly and taste good. This was generally not the case here. 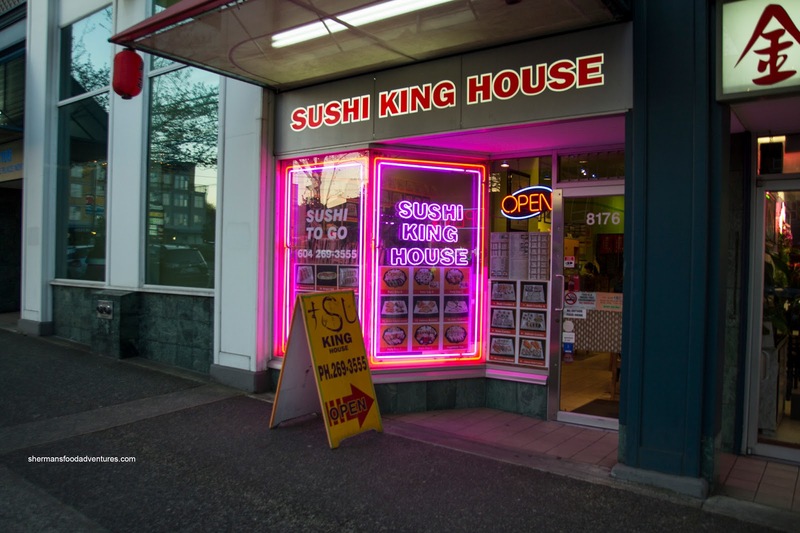 But if you like low prices with large portions, this may be the place for you. At least (looks like) the tamago is still homemade and not outsourced, like a lot of restaurants seem to be trending these days.